Members of Hawaiian Trail and Mountain Club navigate Puu Manamana trail above Kahana Valley. Six years ago, as a new member of the Oahu-based Hawaiian Trail and Mountain Club, Tom Mendes climbed the steep, gravelly trail to the rim of Koko Crater with the help of a rope, on all fours much of the time. HTMC's hiking schedule is posted online. A $2 donation is requested for each nonmember age 18 and older. Children under 18 must be accompanied by an adult (note most intermediate and advanced hikes are not suitable for young kids). Meet at: The mountain side of Iolani Palace in downtown Honolulu at 8 a.m. unless otherwise noted. Wear sturdy shoes, long pants, T-shirt or long-sleeved shirt, and a hat or visor. To bring: Lunch, rain gear, insect repellent and at least one quart of water. Also recommended are binoculars, a camera, cell phone and small first-aid kit. Carry everything in a daypack to keep your hands free for support along the trail. Firearms, pets, radios and other audio and video devices are prohibited. » Nov. 17: Waimano Tunnels, Pearl City, five miles, intermediate. Call Steve Brown, 247-8845. » Nov. 25: Waimalu Ditch, six miles, intermediate. Call Grant and Joyce Oka, 674-1459. » Dec. 1: Kaena Point, four miles, novice. Call Phil Booth, 382-4709. » Dec. 9: Halawa Ridge, 14 miles, advanced. Call Arnold Fujioka, 551-0227. » Dec. 16: Wailupe Loop, Aina Haina, six miles, intermediate. Call Mike Algiers, 422-1048. » Dec. 30: Lanipo, Kaimuki, seven miles, intermediate. Call Justin Ohara, 778-8629. » In addition, HTMC members clear overgrown trails every Sunday. Those interested in hiking, clearing trails or becoming a member should e-mail the club at htmc@aditl.com. Although the ridge of the crater stood barely 1,200 feet high, the route to it was daunting. He and his companions had to cross rugged areas with sheer drop-offs on both sides while brisk tradewinds threatened to blow them over. Now the president of HTMC, Mendes, 66, found that 3-mile trek to be a nail-biter. "I wasn't sure I would do it again, but I have every year since then," he said. "Last year I took my daughter and 14-year-old granddaughter on it, and I remembered my first experience as I watched their white-knuckled, on-their-hands-and-knees movements across the narrow crater rim." HTMC was founded in 1910 by Alexander Hume Ford, a Chicago newspaper reporter who moved to Honolulu in 1907 and became a successful businessman. It currently has 450 members ages 18 to late 70s, from all walks of life. "Less than 200 are active hikers," said Mendes. "Many of them live on the mainland or are no longer able to hike, but they pay their annual $25 dues because they want to support an activity that has been a big part of their lives." Hiking didn't become a regular part of his lifestyle until he retired in 1999 as manager of Hawaiian Electric's facilities department. As an Explorer Scout in his teen years, Mendes had hiked wilderness regions on Oahu and Kauai. He first heard about HTMC on an Explorer survival training expedition in Schofield Barracks' East Range. His instructors regarded the club's members as experts on Hawaii's hiking trails. More than 40 years passed, during which Mendes was busy raising a family and building his career. When he retired, he began walking through his Waimanalo neighborhood to keep fit. Mendes said HTMC had always been in the back of his mind, and he finally decided to join the club in 2001. "Now that I'm retired, hiking has become the perfect activity," he said. "In addition to great exercise, it complements my interest in native plants and provides an opportunity for social interaction -- and solitude when I need it." MENDES ESTIMATES he's hiked at least 80 of the 90-plus trails on Oahu. HTMC organizes hikes on different trails every weekend. Most are open to nonmembers; no advance reservations are required. Because HTMC can obtain permits to use trails on private land and in areas controlled by the military, participants can explore magnificent sites not usually open to the public. According to Mendes, it's difficult to name the "best" Oahu trails because of the great diversity in views, challenges and environments. "What people will enjoy depends on many factors such as their age, physical condition, hiking experience, special interests and amount of time they have to do the hike," he said. His favorites include Kuaokala Trail, a game bird hunting area near Kaena Point. "You can hear the calls of gray francolin, ringneck pheasant, chukar, wild turkeys and other birds while you're there," he said, "and because it has a lot of loblolly and ponderosa pines, it's like being in the Sierra Nevada range without leaving home." 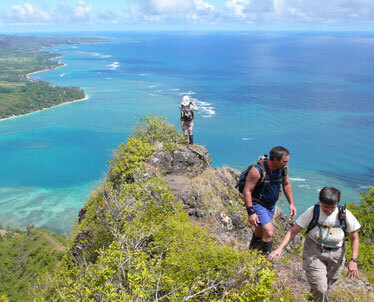 Mendes also recommends the well-graded Halawa Ridge Trail, which leads to the summit of the verdant Koolau Mountains. "With stands of large sandalwood, ohia and koa trees, it's one of the few examples on Oahu of a native Hawaiian forest," he said. "The plants there are not especially rare or hard to find, but they've been left to grow to mature size. Unlike those on Kauai and the Big Island, native trees on Oahu are generally not big or tall." As HTMC looks to its 100th anniversary in 2010, Mendes points out its interesting dilemma. "Our mission statement includes 'preservation and conservation of Hawaii's forests and wild lands' as well as 'encouraging hiking, camping, mountain climbing and other outdoor activities,'" he said. "Are these objectives conflicting? Do we continue to grow our activities, possibly risking the preservation of our fragile Hawaiian environment? I suppose the answer involves an intricate balance between usage, education and protection." Every Wednesday, Mendes goes on a hike with two dozen other people who share his passion for the pastime. "Few things would cause me to cancel that hike," he said. "It's a way to rejuvenate myself physically and mentally. It gives me a spiritual boost as well. And I'm among friends who, like me, really look forward to getting away from noise, traffic and crowds to be in the splendid company of nature."